If you like the SLR iPhone app that lets you take studio pictures from your iPhone, you’re gonna love LightStudio ($1.99 on the app store). It is a great fun while riding the train to work, or waiting on the bench for your date to arrive. The application is built from a series of lighting setups each has several tabs or “functions”. If you are familiar with lighting, the first tab is kinda trivial and shows the setup and a sample portrait taken with that setup. By setup I mean “Rembrandt Light”, Clamshell, Butterfly and so on. If, on the other hand, you are new to photographic lighting, this is a great resource to have on your next train ride. Just browsing through the setups and getting familiar with the “classic” lighting positions. The next tab is a “tutorial” – a short textual description of the setup and some more details about it, like how to set it up, or what kinda faces it flatters or how much drama it gives. The third tab is where the real fan is at. 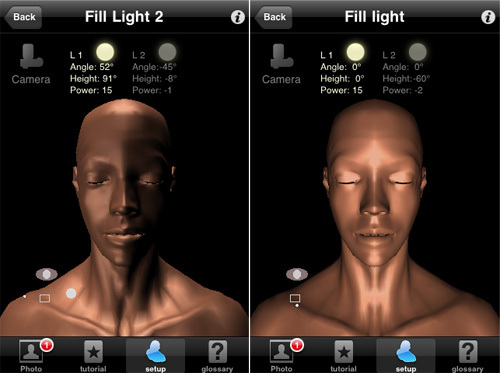 The third tab is a live 3D lab where you can change the position, height and strength/ratio of up to three hard light sources and watch how they impact a 3D face model. You also take a picture screenshot by pressing the “home” and “sleep” buttons (like I did below). Hours of fun. The only caveat is that you only have hard light sources. Darn. I would love to see some modifiers. good ol’ photoshop file by Kevin Kertz. and Strobox for the iPhone. If you tried the app and liked / hated it share in the comments.